Kansas City is a great place to live because it is a great place to work, raise a family and play. If you like to watch Sports we have plenty of teams for you to follow, if you like The Arts, Kansas City offers many world class venues to educate yourself or get involved. The BBQ scene, nothing compares to Kansas City for that. What about Family Fun? We have that covered as well. Kansas City offers its families many unique (and sometimes free admission) to a variety of attractions and fun across the Metro area. Kansas City is home to Hallmark and Hallmark has generously opened its doors to the children in our city by offering them a playground of creativity on Saturdays! Housed right outside Crown Center and adjacent to Halls Department Store, Kaleidoscope is a playful art session lasting 40 minutes. Children must be accompanied by and adult and each adult must be accompanied by a child! Free tickets are available on a first come first served basis. To see a schedule of the sessions or to find out more about this family fun activity in Kansas City, check out their website. With over 235 acres of fun and rides, World’s of Fun has been a destination place for families looking to have fun since it opened in 1973. 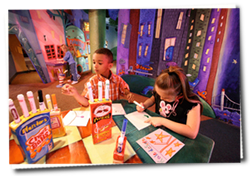 Catering to younger adventurers, Camp Snoopy offers families a theme park experience for younger children. Older kids and adults find a thrill a second on the Patriot rollercoaster, billed as the longest and tallest full –circuit inverted roller coaster in the nation! For more information on the parks hours and admission rates, peruse their website. Oceans of Fun is one of the largest water parks in the Midwest. It offers it’s guests thrilling rides, slides and water activities both for older and younger kids and families. Only closed 3 days a year, The Kansas City Zoo is a perfect place to spend the day with family. All children love animals and seeing them closer than their TV screens. With an array of exhibits from Penguins and Tigers and Giraffes oh my! Your family can become a Friend of the Zoo or Mom and Dad can attend a special date night JAZZOO.